A cleaning contract can cover a personal residence, a business office or a large facility. Whatever the case, it should clearly define what cleaning tasks are to be performed, when and how often they should be done, who will be responsible for cleaning supplies, how the cleaners will enter the facility or home and how they will be compensated. Your contract should say which individuals in the cleaning business will have access to the premises and how the parties will handle matters such as cancellations or damage to the property. If the cleaning business does not have a form contract, you can develop an agreement of your own for its review. To be enforceable, your cleaning contract must be formed by capable parties, exchange something of value, represent the intentions of the parties, have a legal purpose and be accepted by both parties. To be considered capable, the parties must be at least 18 years old and of sound mind. To avoid misunderstandings, the cleaner should agree to all essential terms before you draft the contract. Have a meeting with the cleaner before drafting your agreement so you can discuss major business points. At the top of your agreement, state the names and addresses of the parties and note that the parties are entering into the agreement for the purpose of providing cleaning services in exchange for payment. You should also state when the agreement will begin and when it expires. If you want the relationship to continue indefinitely, you may state that the agreement will last for one year and then continue thereafter unless the parties determine otherwise. Name the individual in the cleaning organization who will be responsible for your building key and when access to the premises will be granted. At the bottom of the agreement, provide signature lines for you and the cleaning company as well as a space for the date the agreement is signed. Your agreement should clearly list all areas that must be cleaned and what services will be provided. For example, a portion of your cleaning contract might state, "On a weekly basis the cleaner shall mop all floor areas in the foyer, dining room, bathrooms, kitchen, study and bedrooms" if the contract is for a home. 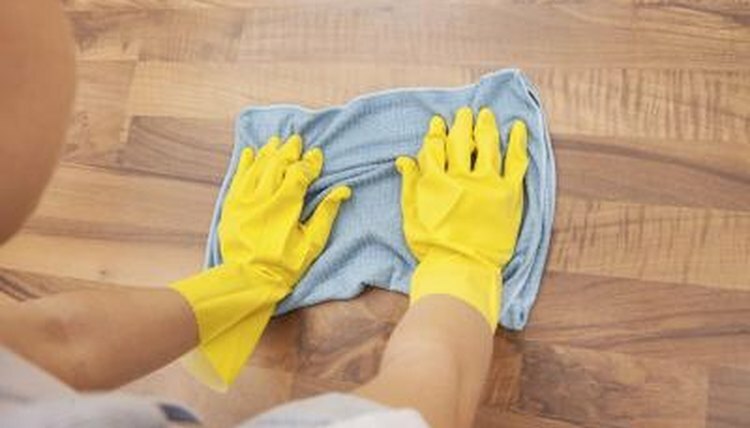 If you have special considerations, such has hardwood floors, you may also wish to specify the type of cleaning supplies that must be used in each area and who will provide them. In addition to routine tasks such as mopping, your agreement should also cover how frequently the cleaner will perform nonroutine tasks such as window cleaning, baseboard cleaning, furniture polishing and shower scrubbing. Your agreement must state how much the cleaner will be paid per visit or how much the cleaner will be paid per hour depending on the structure of your arrangement. Also, if the cleaner will be providing special services, you may wish to clarify that compensation will vary based on the visit. State how cancellations will be handled and how disputes will be resolved. For example: "The cleaner may cancel two times per year as long as she gives at least one full day's notice prior to cancellation. Any dispute between the parties regarding damaged or stolen goods shall be resolved by binding arbitration." Kroeck, Louis. "How to Write a Cleaning Contract." , https://legalbeagle.com/4796779-write-cleaning-contract.html. Accessed 21 April 2019.